September 26, 2018, is National School Backpack Awareness Day, which is marked by many students, educators, health professionals, and parents with backpack weigh-ins, checkups, activities, and special events. 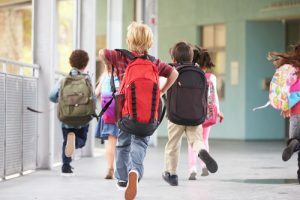 The intention of this occasion, with a tagline of “Pack it light, wear it right,” is simply that: To teach kids, parents, and teachers the best ways to pack and wear a backpack so a child does not experience back pain or discomfort. After all, kids have enough to worry about with schoolwork, friends, and growing up (whether in grade school or college). Help them take a weight off. Haphazard, one-shoulder backpack carrying may look cool. It may be easier to throw a bag over one shoulder instead of both shoulders. However, the uneven distribution of weight for weeks, months, and even years can do long-term damage. Choose the right size backpack for your child. The backpack height should be adjusted so the bag extends from approximately 2 inches below the shoulder blades to waist level, or slightly above the waist. Use a backpack with well-padded shoulder straps on both shoulders for evenly balanced weight. Distribute weight evenly within the bag by loading the heaviest items closest to the back and balancing materials so the child can easily stand up straight. Wearing the backpack’s built-in hip belt will help improve balance and take some strain off of sensitive neck and shoulder muscles. If the bag is too heavy, determine what supplies can stay at home or at school each day to lessen the load. Carrying only necessary items to and from school. Taking an empty water bottle in the bag and filling it at school to reduce weight. Removing unnecessary items from the backpack. Eliminating books and electronic devices that are not needed on a daily basis. Making arrangements to leave as-needed supplies at school, like extra notebooks or a jacket. Have your child clean out their backpack every day to ensure that there are no extra items taking up weight in the bag. Allow them to start each day on as light a note as possible. It will set them up for a good day at school, a good attitude, and good back health. Heavy loads on the back can strain muscles and cause aches and soreness, no matter a person’s age. Adults can take a cue from National School Backpack Awareness Day too. Do you always wear a heavy purse on the same shoulder? Do you carry a briefcase with the same hand every day? Is your suitcase doing your back harm? Small lifestyle choices like wearing a messenger back to better distribute the weight of your bag contents can minimize back strain. Or, choosing a backpack, worn properly, can make you a happier, lighter grown-up, and a parent without back pain. Help your child achieve healthy growth and development. Save yourself from any back discomfort too. If a bag feels too heavy and your child complains of its weight, it is – plain and simple – probably too heavy. If you or your loved ones are experiencing back pain, schedule a consultation with the Restorative Wellness Center in Ann Arbor.